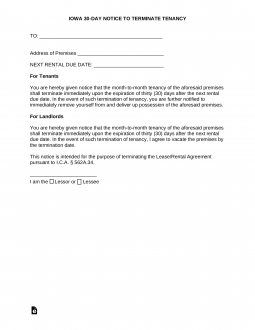 The Iowa termination lease letter is a reusable form letter which will satisfy Iowa State Law regarding terminating a tenancy at will lease if used properly. This form shall give the user the ability to quickly and clearly give the required thirty days’ notice one must give another party they have signed a month-to-month lease with for a rental property. In this way, the benefits of such a lease arrangement is not offset by the trouble caused when replacing either a tenant or a residence. Obviously, depending on the party leaving the remaining party will have to do one of these things. This can be the cause of quite a bit of hardship if handled improperly. By giving thirty days’ full notice such hardship may be controlled and even avoided altogether. Statute 562A.34 – Requires thirty (30) days notice. Iowa State Law seeks to help such individuals stave off potential disaster by making this amount of notice given mandatory. Thus, it is imperative to allow enough time for the delivery of this document when issuing it. In order comply with state law, an Iowan must make sure the recipient has received this document thirty full days before the termination date named within it. Step 3 – Next to the words “Due Date,” enter the next date the rent will be due. Step 1 – If you have hand delivered this notice personally to the tenant, check the first box and enter the date it was delivered. If you hand delivered the notice to someone other than the tenant at the tenant’s address or place of business (who meets the age requirements to receive this notice), check the second box and enter the date the notice was delivered. If you sent this notice by certified mail to the tenant, check the third box then enter the date it was mailed. Step 3 – Sign the bottom of the page.